Molded from the original Thomas Yorke hand-carved 1986 Master, the multi-use casting have never been made available ... until now! Judge how this wall will look with your scale by the look of the HO, O & Scale figures shown in the image. The overall dimensions of each Random Stone Wall is 7-1/2" wide by 6" tall and 3/8" thick. A Thomas Yorke Ent. brick wall will be available early next year! 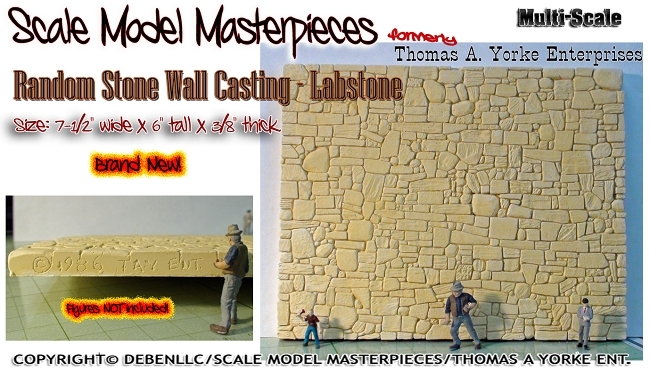 This Scale Model Masterpieces/Yorke Product is an "unfinished LabStone casting using the same high quality material that we use to cast the parts for our Thomas A. Yorke/Scale Model Masterpieces kits. The original masters were originally constructed by Thomas A. Yorke many, many years ago. All of the castings include the shown quality detail (not too much) and all that is left is to stain and install!. Really, you don't know a really easy and fast way to stain Resin, Hydrocal & LabStone castings? Just Ask Doctor Ben!